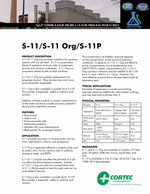 S-11 prevents corrosion in mineral acids, such as nitric, hydrochloric, sulfuric and phosphoric.S-11 Org is especially effective in organic acids such as acetic, citric, formic, tartaric, also in sulfamic, phosporic acids, and EDTA.S-11/S-11 Org do not affect the pH level so it will not affect the technological processes. Usually, S-11/S- 11 Org are used at a concentration level of 0.1-1.0% by weight of total formula, and can be post-added if desired.The concentration of inhibitor required depends on the concentration of the acid and operation conditions. In general, S-11/S-11 Org are effective at low concentrations, but at temperatures over 200O F (93O C), higher concentrations of S-11/S-11 Org corrosion inhibitors may be needed (0.50-1.0% for S-11 and 1- 4% for S-11 Org). However, the most effective concentrations are best determined by laboratory tests.